A broader definition to e-governance implies electronically driven governance where entire services and information are provided to masses by the electronic medium. The most modern and advanced form of electronic communication now-a-days is represented by Internet. Under e-governance, in a technology driven environment information and communication technology (ICT) is extensively used for delivering government services, exchange of information and communication transactions. The entire system hence works as integration of different stand-alone systems and services between government-to-customer (G2C), government to business (G2B). Within an e-governance setup, government services are offered to citizens in a very convenient, effective and transparent manner. The most important audiences that are catered in an E-governance services mode are government, citizens and businesses/interest groups. Primarily four basic models are thus works in order to communicate in e-governance as– government-to-citizen, government-to-employees, government-to-government and government-to-business. However, the terms “E-government” and E-governance are generally considered to be similar. In E-government, ICT is used for government purposes for public administration purposes. It is a one-way method of delivering services with a limited exposure for a common public to take active participation into. On the other way, the perspective of the e-governance is the use of the technologies that help both who are governed and and being governing. In E-governance, the communication occurs in two way method between masses and administrators. The Public-Private Partnership (PPP) based e-governance projects are massive success in India. E-governance is now considered as future of governance, especially, where corruption free government is imminently required. The core to e-governance is reaching to the beneficiary and ensure by systems and checks that services intended for the benefits are served meeting their objectives. There exists an auto-response to support the validity of e-governance, where Government realizes the efficiency of its governance. 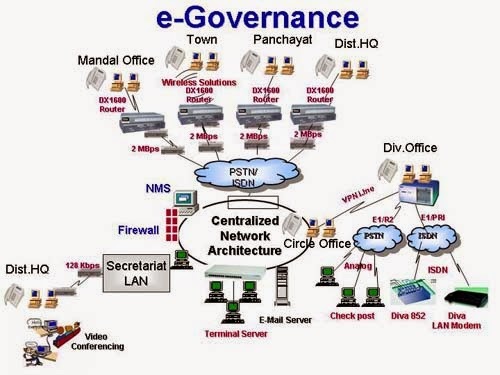 E-governance thus is by the governed, for the governed and of the governed.